Nepal’s one of the most prestigious prize, Madan prize has been awarded to this very book in 2068 BS. 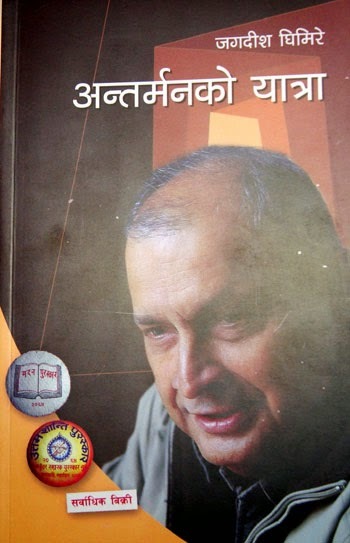 Jagdish Ghimire is the author of “Antarman Ko Yatra”. He has well sketched the beauty and the beast of his life in “Antarman Ko Yatra” which literally means Journey of inner feelings. Not only that, this autobiography is also be able to brag Uttam Shahitya Prize for his excellent skills to serve heart touching feelings. Jagdish Ghimire’s life is presented like an adventurous movie which is surrounded by cheers, miseries, ups and downs. After reading this book, personality Jagdish Ghimire can be understood by multiple ways, a talent littereate, a sacrificing social worker, a revolutionary young leader, a responsible son, a respected father and a lovable husband. Listen Antarman Ko Yatra by Jagadish Ghimire on the voice of Achyut Ghimire.